I just have to thank you for so much love. Thank you to the channels and all beings of light. I come to write about my son today. He is eight years old and very afraid. I know that fear is the most powerful matrix in the world in which we find ourselves; he sustains the illusion on this plane and all of us who are incarnated, not enlightened, feel fear to some degree. But my son is very frightened, much more than his six-years-old sister. I try to show him that light is the greatest power that exists and more powerful than any fear, that he is this light and that he does not need to feel fear. I try to empower him, show him how he is brave, strong and capable. I also try to invite him to explore his fear, to talk to him, to listen to what he is telling. I tell you that fear use lies to deceive us, that if you talk to fear when you go to see it, it was nothing like that. Anyway, I try to help you as I can. But I have not seen advances yet; the fear he feels is still very strong. I feel helpless when I try to help my children and I cannot. I know they have to do their part, but which mother does not want to see her child well? Can you help us? Gratitude! Daughter, your child is in the natural process of a child who brings restrictions. But understand that you are energetically united and he feels what you feel. The relationship between mother and child, on the material plane, is stronger than she conceives. But see that even though you want the good of your child, you are transmitting fear as to the feeling he cherishes. You think that someway this feeling might harm him in the future. Not consciously, daughter, you make this fear even more evident in his heart. If you really want to help him, do not worry about it. Let the process develop and be the example with your actions, with your gestures, but above all, in the energy you carry, trusting that the best will always be given. His confidence will be transmitted to him and it will be the fuel, the seed, so that from his inner strength he transcends the obstacles he finds within himself. Look at this as a natural process of development and trust, daughter, that he has his angels, guides, and everyone to help him. Be in peace. HOW TO FIND THE REPLIES WITHIN ME? Hello! Dear Masters, grateful for your help. I want to develop, to evolve spiritually. I see that I have made great strides, but I feel trapped, unprepared. I ask for guidance. There are also issues with my love relationship, it's time to move on, what I can do to love myself more and not put my expectations in the other. Which beliefs do I have to release in order to live the full potential of my being? I know the answers are inside me, I ask for help to perceive them. Fraternal hugs. Daughter, if you want to receive the answers that are within you, close your eyes and breathe. Three brief breaths. Calm down and calm down. Start feeling the relaxation of your body. At that moment, peace radiates to you. You are the peace and it is affected by a deep silence. There is nothing around you. You are in the energetic world. At your side there is only energy. You have turned into a golden sphere, of pure wisdom. Around it are only spheres of light, of many colors. But these spheres do not matter to you, for you are the sphere of the center of pure light. This sphere radiates and promotes in everyone around him this peace that overflows with love and inner wisdom. Continue to breathe. Your body, do not worry about it; it is reflection of that light. Now a white light bathes that golden light that is you. It is a divine light, a crystal light. It is the light of God that now bathes your conscience. You are this golden light bathed in the light of God, the divine light. And then, you are in the arms of God, in silence, with love. Nothing else matters, for God embraces you, and enlightens you and reflects in your heart. He is you and you are him. You become one with God. Now ask this question to him, let me come, in that meekness, in that stillness. Let the light radiate your mind. You are light, you are God and you can seek all the answers from this state of peace and trust, of love. For God is at the helm of your life. Now, that sphere descends to the physical plane and radiates its entire body of light. You are protected by the divine Light that becomes the most beautiful golden light. This light envelops you and you breathe feeling that light that bathes you and fills you. Be in peace daughter, you are light and can rather seek in your heart the answers you need. They are next to your silence, just trust your intuition. Be in peace. I'm your brother Serapis Bey. 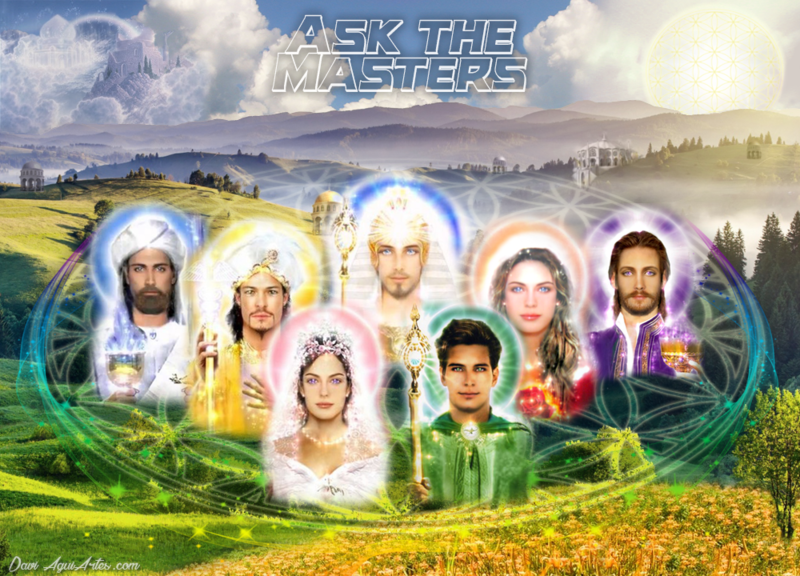 Beloved Masters, thank you for this opportunity to speak with you. Would I like to understand why I'm so afraid of taking responsibility? I aim for great things, dream, idealize, plan, but in practice, I only procrastinate. It's as if I unconsciously do not feel worthy to have a wonderful life. Thank you very much. Greetings, my brother. The greatest commitment is with our own development, with our light, with what guides us. Everything that thinks to restrain you, in fact are illusions that say nothing about you. The greatest fear you carry is what you need to transcend, its pride, my brother. When you stop worrying about what might or might not work out, you will see that everything will begin to flow. The pride I say is the fear of judgment, of trying and not succeeding. When you give up that feeling, the fear of what you can say about your attempt, you will then begin to test your thoughts. You can then play in life, walking so that everything happens naturally before you. Do not worry, my brother, with what they will say about you. Trust your intuition, let go of the fear of judgment and live the life of heart; erring yes, but at least trying, instead of simply seeing life pass before their eyes. Be in peace. Beloved Masters, I am very grateful for the opportunity to be here to receive help and teachings. From time to time, I have been working towards my spiritual evolution. In addition to attending a Spirits Center, I have read and heard about many things, including the activation of the "trine flame" and the "violet flame", and the so-called "Star Seeds". Reading about its characteristics, I identified myself a lot and knew that it can be activated as well. I would like to know if I am a "seed of the stars", but I have doubts if I should try to do these activations, because I do not know if it is the correct one, spiritually. I do not want to do anything wrong, only what is right and allowed to me. I would like to know if it is correct, whether I should do them, or whether I should only follow the guidelines of Spiritism. I would also like to know about my current job. I do not feel good in that environment; I've suffered a lot there and I have no pleasure in working or being there. I think maybe I'm there for my learning and my spiritual evolution. I would like to know if I should continue in this job, accept it in order to get my progress or if I should go out to find something with which to identify me and feel good. Thanks so much for the help! Son, the great question is the division that anchor in the mental plane, to be "seed of the stars" or not, to be spiritualistic or not. But in creating this division, they do not realize that everything is made of the same primordial energy of the source, of the same light, of the same repository of love. All souls on and off this planet have the same divine origin, which burns in the heart and has always been with you. All the rest, son, are mechanisms of trying to disassociate from the mind, grid, and planetary illusion. All of these options are valid if you talk about your learning moment. Need to observe, on the other hand, that each has its evolution phase, every human being in this world has its path. Some decide one way, some decide others. But all paths will lead you to evolution. There is no better or worse. There is the divine light that radiates to all. What you need to learn, is to look at each of those doors that are in front of you and see if what is behind it attracts you or not. You can open and close, and move to the other door. None of them is definitive and each one will bring you a beautiful experience. The doors open, in some you enter, but then decide to leave. And everything is fine. There are no definite choices. There is a choice of the moment and nothing is definitive in life. Some take longer to be reopened, that's true, but they will. Always listen to your heart, son, never look for an external response. Listen to what resonates with you at the time of your evolution. The answer to your question can not be answered by another person, but by yourself. Be in peace. Messengers: Thiago Strapasson and Michele Martini - June 2017.